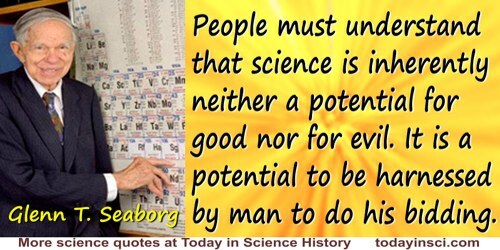 People must understand that science is inherently neither a potential for good nor for evil. It is a potential to be harnessed by man to do his bidding. Interview, Associated Press (29 Sep 1964). In Bill Swainson, Encarta Book of Quotations (2000), 833. Scientific practice is above all a story-telling practice. ... Biology is inherently historical, and its form of discourse is inherently narrative. ... Biology as a way of knowing the world is kin to Romantic literature, with its discourse about organic form and function. Biology is the fiction appropriate to objects called organisms; biology fashions the facts “discovered” about organic beings. Primate Visions: Gender, Race and Nature in the World of Modern Science(1989), 4-5. [about Fourier] It was, no doubt, partially because of his very disregard for rigor that he was able to take conceptual steps which were inherently impossible to men of more critical genius. As quoted in P. Davis and R. Hersh The Mathematical Experience (1981).